Here at Weston, we are very proud of our Early Years setting and we are sure your child will make a fantastic start to their education here! We have one intake into our Nursery, which is in September. Please note we run morning sessions only on a Monday to Friday. Doors open between 8.45 and 8.55 and sessions end at 12 noon. Attendance required is every day i.e. full time morning sessions. Attendance is term time only. Please look at our oversubscription criteria (see document below) which will give you an understanding of how we select pupils who apply and how we offer places if there are more applicants than places. Nursery admissions are managed by the school. We have 10 places available for Nursery aged children. 30 hours nursery care is available on-site at the school through partnership working with Peanuts Preschool. Children can attend our Nursery in the mornings and Peanuts Preschool in the afternoons. 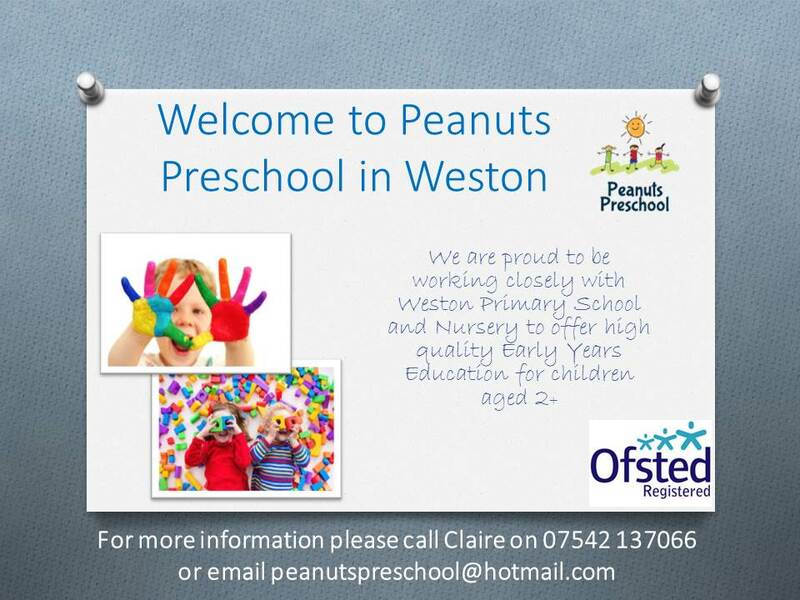 To apply for a place at Peanuts Preschool, call Mrs Claire Mason on 07542 137066. Please apply directly to the school using our application form and signing the declaration form (see documents below). Once completed, please either email the application form and the signed declaration form to nurseryadmissions@weston.herts.sch.uk, or post them to us or drop them off at the school office. Applications to the school close at 1.00pm. Applications received within the above period will be considered at the same time and admission rules applied equally. Applications received before 1st January will be considered as having been received on 1st January. Offers will be emailed/posted out to parents for our new Nursery starters.